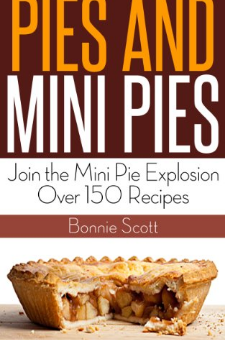 Join the mini pie explosion! Bite size mini pies are all the rage!Pies are great for any day of the week. Their versatility means they can be a filling snack, a meal on their own or even be the main dessert in a dinner party.Now, with Pies and Mini Pies, you have a book with over 150 pie recipes that will tickle the fussiest of taste-buds, with ideas that include: Apple Crumb Pie and Mini Pies Fudge Pecan Pie and Mini Pies Butterscotch Cream Pie and Mini Pies French Silk Chocolate Pie and Mini Pies Sweet Potato Chiffon Pie and Mini Pies Frozen Raspberry Pie and Mini Pies And more...With helpful tips, Pies and Mini Pies is a cookbook that provides you with the answers to the perfect pastry as well as what goes inside.Buy Pies and Mini Pies today and see for yourself how quick and easy it is to make a delicious dessert!